I really enjoyed entering this challenge, although it was a bit of a Marathon. - Saturday afternoon: weather forecasts were optimistic, so I tried my luck and started the project. Traveled to the lake near my house, took some shots of it, as well as the cloudy sky and the horizon of trees. Back home, I set my home studio to simulate light coming from the behind, and took many photos of me in a suit, of leaves from my garden, and flowers. When all of this was finished, it was 8.00pm. - Saturday evening: the moon! I took my tripod, my 600mm + 1.4x extender, went to a good viewpoint, and crossed fingers... This is where I got lucky, I got a clear shot around 10pm. One hour later, the whole area was submerged in fog! This was a short window, but sufficient. Back home again... now, processing! I worked until 4.00am. 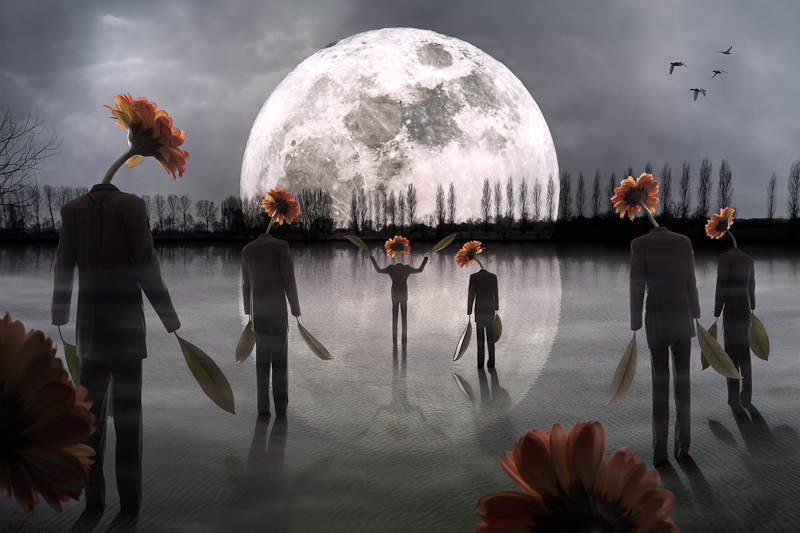 At this stage, the lake, trees, moon, 2 'flowermen' and all their reflections were done. - Sunday morning: more processing! I worked from 8.00am to 3.00pm, at which point most of the picture was finalized. I was still lacking some birds, so I went out again, and shot some during 2 hours. Then I spent the evening trying many color adjustments, tones, and polishing the whole. The final entry was uploaded 2 hours before the deadline (i.e. 3.00am french time). I realize my processing skills are very far from real wizards' ones, but I am happy about my progression. Moreover, as I write this, the votes and comments have been absolutely fantastic: I am so delighted! Thank you all! Very cool picture! Congrats on the ribbon! what a cool shot!!! congrats on your ribbon...well deserved! I want to hang this on my wall. WOW WOW WOW WOW WOW! You got 50 votes of 10. That's quite phenomenal (and more than the blue ribbon winner got!). I was one of those... I also thought you would get the blue. Once again I am in awe of your creativity. Splendid image! Creativity at its peak! Great imagination! Congrats on the ribbon. Nice and imaginative! 10...Congrats on the Red! Congratulations on the red! Perfection as usual! Very well done and congrats on the placement. I am not really a fan of the more 'graphic artist' approach to photography, but of those in the challenge, yours is clearly the most creative and engaging. I have to commend you on your imagination firstly, your photography skills secondly, thirdly on your passion to photography and finally on your editing skills. A wonderful shot(s) and an end result that truly makes an observer look deeply at the picture and think of many (strange) things! Congrats on the PB - after all the work you deserve it! Congrats on the red and new PB. You must be out of your mind to do a composing like that, though. This is brilliant. Your creativity continues to astound me. 36 photos and 140 Layers??? Now that is dedication to your art. Huge congrats! this is incredible!!! knew it was gonna be top three. I also knew it was yours because I recognized the background from your balcony photo. Huge congrats on another brilliant work and new PB Christophe!! Hard to believe those six 2- votes. Your image says Gyaban all over the place, and you are a ribbon hog, maybe that affected a bit. I have calculated what your score would have been w/o any 2- vote (as in the blue ribbon winner histogram) and the result is 8.0517, that's closer to what this fantastic work deserves. Oh what fiiine FINE ART! Who would EVER think that a 7.8 would not win blue! What an amazing challenge! And an even more amazing photo! wow , I just read that 140 layers, sounds like a date I had once. 140 Layers?!?! Oh my!!! spectacular! awesome!! A new classic!! Congrats!! I have a hard time believing this didn't win, actually. Heck of an accomplishment! sooo weird. but a really cool use of expert editing. Winner. Love it. So out there. Very nice job with the reflection. Not sure I understand the "people" but it looks neat. The killing detail IMHO is the flock of birds :-). Great job !!! oh my word this is phenomenal. SO creative. You could do Cirque du Soleil sets or something good like that. WOW. Aiming to be different and succeeding. A wonderful concept. When I see "Expert Editing" as an option, this is the kind of work I expect to have to compete against. This is beautifully composed, very well executed and worthy of the ribbon page. Flawless. At first glance of this photo, I was stunned silent. But I had to come back and say this is absolutely incredible. My first favorite on this site. Great job! This is absolutely fantastic in concept and execution. A 10 and a fav, and I would give you an even higher score if only the scale went higher. You have really outdone yourself this time. The postures, the lake setting (I've seen that before in another image that won blue), the creativity, the high quality of this work has be Gyaban. I like everything except the fog that should be seen in front of the figures, in other words the mist should have been painted out of the figures. Maybe it was by design? Either way, there are so many awesome elements I have to give it my 10. Most original and unique of the challenge. To image for sure. my guess is Gyaban - if I am wrong you know I meant it as a compliment! Beautifully done! I absolutely LOVE this, my favorite of the challenge! This should ribbon and if it doesn't you were robbed. Already voted (10) coming back to comment. One of the very best imaginative works. Very nice! Very very good photo manipulation skill!!!! great job!! I already said gratz on your ribbon on one image but I think this one will steal the blue. Gratz in advance. Wow, what an inspiring imagination you have... I seriously love this! The creativity and execution are flawless. I really hope this ribbons. Proudly hosted by Sargasso Networks. Current Server Time: 04/24/2019 04:39:39 PM EDT.